Come and see why we are the leader in Preschool through Grade 8 education. Your introduction to RA begins here! At Ridgefield Academy, we teach children how to learn. 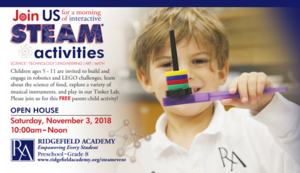 On Saturday, November 3 from 10am to noon, RA will host its Fall Open House and invites you to a morning of interactive STEAM(science, technology, engineering, art and math) based activities and an opportunity to learn about our Preschool through Grade 8 Program! Parents and children (ages 4-11) are invited to create together and build and play in our Tinker Lab, construct and engage in robotics and LEGO challenges, discover the science of food, explore a variety of instruments used in our music program and so much more! During your visit, you will also hear from Head of School Tom Main regarding his philosophy on the Preschool through Grade 8 education, meet members of our talented faculty to learn the importance of RA’s commitment to educating the “whole child” through our engaging program, and get an up-close look at our impressive facilities. Tours will also be available. This event is open to the public. For more information and to RSVP, please visit www.ridgefieldacademy.org/steamevent. Established in 1975, Ridgefield Academy is a Preschool through Grade 8 private day school located near Ridgefield, CT serving students from Fairfield and Westchester Counties. RA is committed to academic excellence which is evident by its challenging and innovative curriculum enriched with programs in public speaking and community service, STEM labs, athletics, performing arts opportunities, and interdisciplinary projects. At RA, students are encouraged to discover their talents and follow their interests wherever they may lead. They learn to make decisions for themselves, to take risks, to be resourceful and resilient, and to give back to their community. Come get to know why Ridgefield Academy is right for your child. We look forward to your visit!